Manufactured in Inconnu from 2000 until 0. 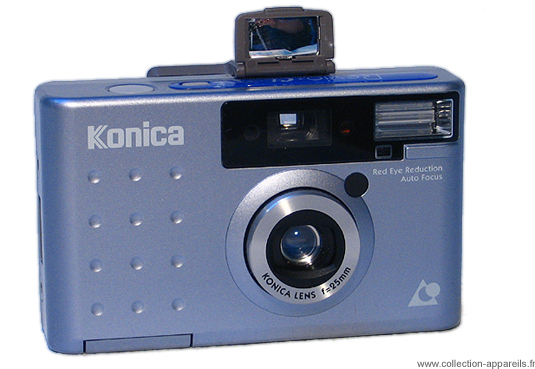 This "mini-compact" has a lens of 6.7/25mm with 3 elements in 3 groups, for the APS film size. He has an electronic shutter from 1/80 up to 1/250 sec. The exposure is programmed for the central metering. Loading and rewinding are automatic. The DX coding is recognized. There is a possibility to choose between the frame-by-frame shooting or burst. The flash is automatic and there is an anti-red eyes device. Its uniqueness is to have a retractable mirror on top allowing the operator to achieve self-portrait thanks to the electronic self-timer (valuable for lonely sailor...).